One of my favorite rules from John Moore at Brand Autopsy is his Law of Remarkability. Simple, if you want to be remarkable, do something worth remarking about. Last night I got to see that first hand. Anyone who knows me knows how much I (and my son) love baseball. 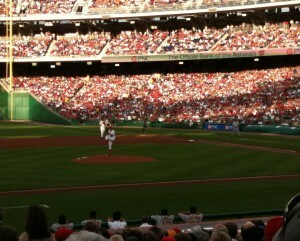 Last night, I got to see the rookie phenom Stephen Strasburg's debut for the Washington Nationals. Strasburg's debut was highly anticipated and many say over-hyped. Then he took the mound and became the first rookie to ever strike out 14 batters and walk no one. Needless to say, people are talking about him today. We got to the game just in time to see his first pitch (that's the picture). I knew everyone would be standing taking pictures on his first pitch. What shocked me - and I've never seen anything like this before - is that everyone stayed standing for his second pitch, and his third, and fourth, and fifth... People didn't actually start sitting until he was pitching to the third batter. What makes this story even more fascinating is that Strasburg has almost nothing to do with the hype. He doesn't spend time talking about himself or running around doing interviews. He does the most important thing any marketer can do - he does something worth remarking about. Now, as much fun as that was, tonight is an even bigger night. My son, who's 12U team is The Nationals, plays for the championship, and certainly people will be talking about that. :-). Update: The Nationals (my son's team) won 11-9 to win the championship.